Battersea Park Station is an Italianate style railway station built in 1865-67 for the London, Brighton and South Coast Railway. It is located at the south-east corner of Queens Circus on Queenstown Road, and is just north of Battersea Park Road. The station provides access to trains out of the London terminus of Victoria Station to south and south-east London suburbs. The station remains effectively unmodernised since its construction. 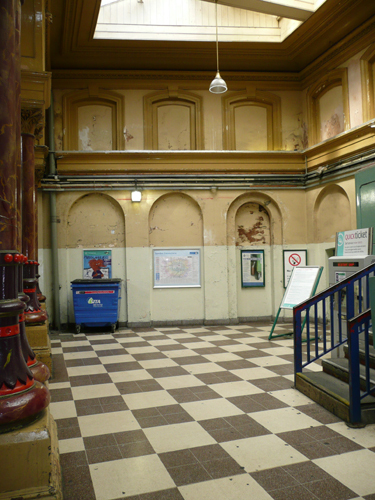 Access to the platforms is via steep wooden staircases, and it is due for a complete refurbishment as part of the redevelopment of Battersea Power Station. 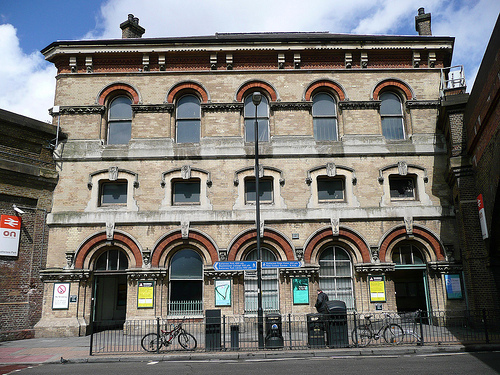 The station is listed Grade II. The high Booking Hall has an arcade supported on pairs of leafy cast-iron columns decorated with female heads. I was commissioned to carry out the paint analysis of the booking hall.